We all know that there’s a great deal to be done before we drag the warm clothes out of the basement, and fall cleanup is at the center of all chores. Prep the lawn for the dormant time, winterize the sprinklers, clean the gutters, you name it. The middle of August through the middle of September is one of the best times of the year for lawn renovation and reseeding. Practices such as dethatching and aerifying are all best done at this time of year. The primary reason for this is related to the grass plant’s active period of growth and recovery during early to mid fall. Are there trees that need trimming? Hedges that need pruning and shaping? Dead trees that need to be cut down? Maybe you’re planning to do some light landscaping. Maybe even install a new sprinkler system. Now is the time to decide whether you want to undertake these tasks yourself or hire a Lawn Care company to do them. You’ve spent hundreds or thousands of dollars sodding or seeding your yard, now what? How do you care for it? Water it? Fertilize it? Mow it? One thing’s for sure: these things need to be done! Rake Leaves—Raking leaves (or mulching them) is critical so that they don’t cover your lawn and choke out the grass you worked on all summer. Lawn Fertilization—Don’t forget your lawn just because you’re not mowing it every Saturday. A round of fertilizer can make the difference next summer. Lawn Aeration—This key task helps air, water, and fertilizer get into the soil and create a healthy lawn even during the cold times. Winterize Sprinklers—Any water left in the sprinkler system or pipes could freeze, crack, and ruin the system. A fertilizer specialists will examine your lawn and gardens, assess the health of your plants, measure thatch depth, note any weeds, insects or diseases that might be present, and do a soil analysis. Based on their findings, they will create a fertilization program to provide the nutrients necessary for your lawn and gardens to flourish. 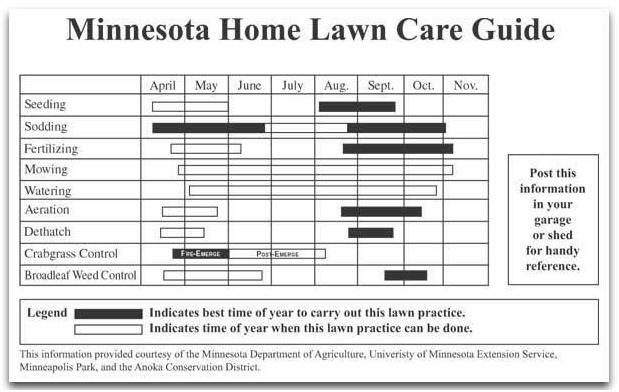 This lawn care calendar is a guide to maintaining lawns in the upper Midwest. It covers the general care needed to adequately maintain an average home lawn. Lawn maintenance takes time, and many busy homeowners don’t have the hours it takes for fertilizing, tree trimming and weeding. 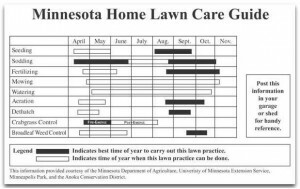 With all the other tasks associated with owning a home, lawn care is a great project to outsource to a Minnesota Landscaping company. If St. Patrick can drive the snakes out of Ireland – well, Lawn Care Company will drive the unwanted critters out of your property!! !